The other day I received a new clock. This is my first flip clock I have laid my hands on since I had a defective bedside table radio with a flip display as a child. This specimen was new old stock, still in its original box. On its journey across Germany it must have received the odd bump. 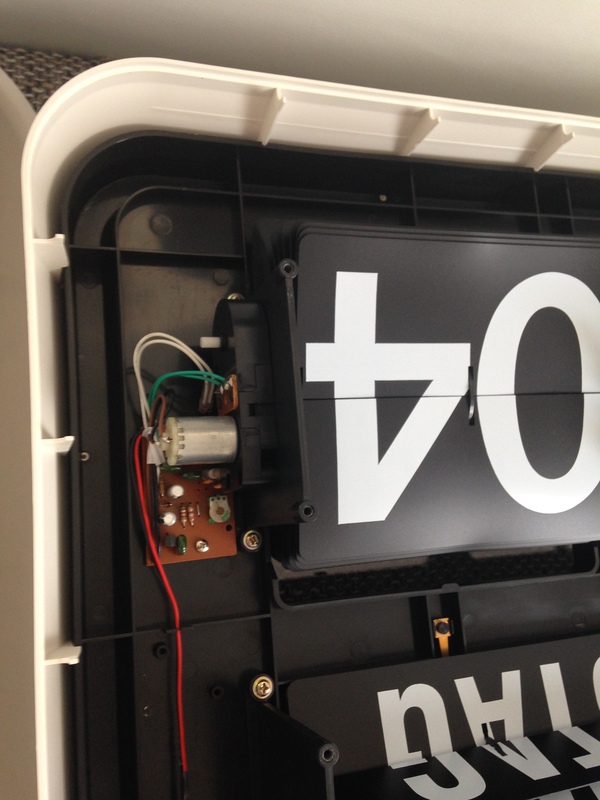 The minutes flap for ‘04’ had partly popped out of its rail as you can see from the pictures. However, the seller had expertly tested the clock over the last few weeks and had packed it extremely well. So all good. Very happy. I careful removed the many screws on the back of the clock and carefully opened it up. What a well built machine. The fix was straightforward. All I had to do is flip the minutes around with the adjustment lever until ‘04’ came up and then gently force the top centre flap back into the rail. There did not appear to be any special, ‘safe’, method of doing this. But that worked perfectly. Opening up the clock gave me an opportunity to take a look at the Quartz drive oscillator and its associated circuitry. This is the BQ-1700 which I understand is simply a Quartz version of the same clock that was available as a slave clock / Nebenuhr under the Bürk model name DIGIDATE 100. The driver circuit is based on the Intersil ICM7213IPD DIP chip (see data sheet here). This chip, among other outputs, provides a 1PPS (1Hz) pulse as well as a pulse every minute. The 1PPS output is connected to a small red LED to the right of the Minutes flap. This provides immediate indication that the clock is powered up and the oscillator is running. The one pulse per minute drives a small motor which advances the mechanism forward with each passing minute. There is another motor for the day and date flaps. I did not closely examine the day date mechanism, the circuit or the wiring but will at a later date (no pun intended). I would like to also be able to drive this clock from the one pulse per minute slave clock output from my Bürk HU100SiSuSa master clock / Mutteruhr / Hauptuhr. However, I of course want to be as noninvasive as possible in making such modification and wish to maintain the ability to easily switch back over to the internal Quartz oscillator. There is plenty of space inside the clock for this. With appropriate circuitry this clock could of course also be connected to the 1PPS output of the Trimble Thunderbolt GPSDO or that of a DCF77 receiver module. In time I will study more closely the ICM7213IPD circuit and examine the once per minute pulse on an oscilloscope to see what is needed to correctly trigger an advance in the mechanism. That should be quite simple. Setting the clock was also straightforward. The clock’s calendar needs to be set to take into account what year it is in a four year cycle so as to keep the week day flaps in sync. It is a perpetual calendar mechanism so it will take account of leap years. 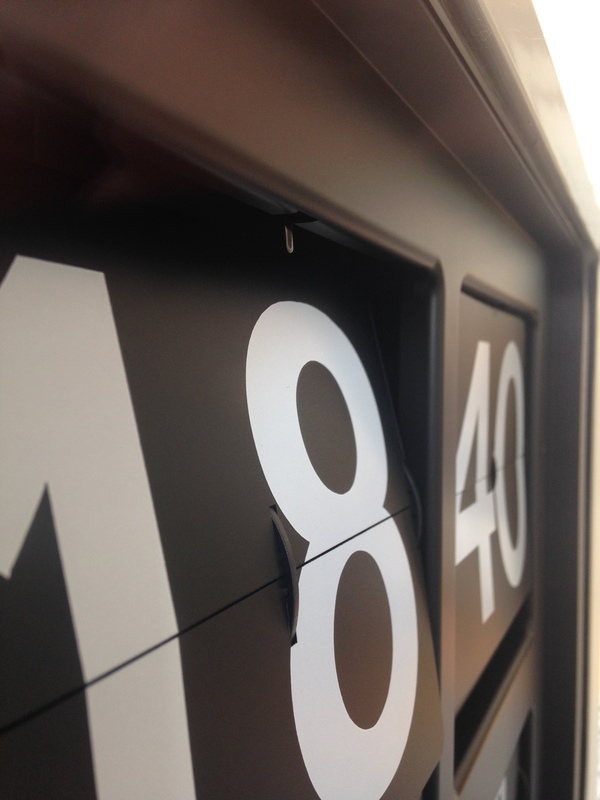 I believe this clock is actually produce by the Hong Kong based firm Twemco.